A period of daily physiologic quiescence is a predictable and seemingly inescapable phenomenon in nearly all organisms from yeast to primates. Humans have long pondered the purpose of this seemingly disadvantageous state. Fortunately, recent discoveries have shed light on the evolution of sleep, its nature, and its function. Physicians and, in particular, neurology residents find themselves in a uniquely challenging position. During training, they learn about the importance of sleep in brain health and the consequences of sleep deprivation yet must curtail their own sleep. One week they discover that poor sleep may contribute to the aggregation of insoluble β-amyloid, and the next, they are learning about the role of sleep in emotional regulation with consequences for substance abuse and suicidality.6,7 This unique combination of insight and sleep disruption primes a neurologist for burnout. The challenges start early. Beginning in medical school, usually with clinical training—historically during the third year—a culture of sleeplessness is established. The shift from founda-tional learning to clinical training is often jarring on sleep and circadian rhythms as the student shifts from relatively consistent wake-sleep patterns to early starts, late evenings, disrupted meals, and inconsistent exercise routines. Later, as neurologists enter residency, they experience more sleep fragmentation when they begin taking overnight on-call duties. Of course, once physicians enter practice, duty hour regulations are lifted, and many neurologists begin having more than 80 hours of work per week plus all of the sleep disruption that comes with a busy clinical practice. Even if they work less than 80 hours per week, many neurologists suffer from sleep and circadian rhythm disorders affecting their mood, cognition, and cardiovascular health. Concerningly, poor sleep puts us at risk not only for metabolic disturbances, cognitive dysfunction, and sleepiness, but also fatal motor vehicle accidents. Ultimately these consequences are felt by our patients when our ability to practice medicine is impaired. Fortunately, there is good reason for us to be hopeful because sleep and circadian rhythm disturbances are easily managed—even as call and overnight shift work must go on. When would you naturally fall asleep? How late could you sleep in? When would you wake up without an alarm? For most individuals, this thought experiment will bring to mind a certain sleep schedule. More often than not, this sleep schedule is misaligned with our work, educational, and social obligations. 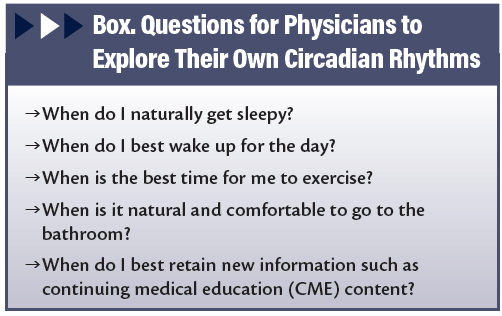 For most young physicians (ie, residents) who struggle with sleep, the most common scenario is that they have a circadian rhythm delay, meaning that under a genuine ad lib schedule they would naturally go to bed later at night and sleep in later in the morning. Circadian rhythms are typically delayed in adolescents and young adulthood and then progressively advance over a lifetime.11,12 Sometimes a circadian rhythm advances to the point where a person would naturally fall asleep and wake up earlier than desired. This is called an advanced circadian rhythm and manifests with an individual who is excessively tired in the evening but can’t sleep through the night. It is critical for each individual struggling with sleep to define their circadian phase because most sleep disorders are, at least in part, circadian disorders. Further, unless the circadian rhythm is properly aligned, individuals’ sleep symptoms are unlikely to be resolved. Once a circadian rhythm is identified, steps can be taken to shift it toward the direction of more restful healthy sleep. For example, take the common situation of a circadian rhythm delay in neurology residents. They struggle to fall asleep early enough in order to wake up refreshed in the morning. If given the opportunity, they would naturally fall asleep later and wake up later in the morning. Characterized by lower extremity discomfort that worsens in the evening, during motor quiescence, RLS interferes with sleep onset and restoration. The discomfort of RLS is relieved by movement, although only momentarily. For physicians in training, adjusting to overnight shift work is challenging. Although each individual responds uniquely to sleep restriction and circadian disruption, there are a few evidence-based strategies that can help (Table 2). In particular, in the days leading up to the first night of overnight work, start adjusting the circadian rhythm later with bright light therapy (eg, use a 10,000-lux light box) in the evening and, if practical, sleep as late in the morning as possible. Once work has begun, use bright light therapy for the first half of your shift and wear sunglasses on the way home from work in the morning. If needed, take a small dose of melatonin (1-3 mg) at your desired bedtime. Work to achieve consistency in timing your meals and exercise, which—along with bedtime melatonin and wake time sunlight—are important zeitgebers (literally “time givers”), reminding and reinforcing your circadian physiology. On weekends, try to maintain schedule consistency, even when not working, because people do best if they do not shift their schedules forward or back by more than 2 hours on a weekend. Shifting more than 2 hours makes it substantially more difficult to switch back to overnight work schedules, resulting in “social jet lag” upon returning to shift work. Because overnight shift work is often socially isolating, support from family, roommates, and friends is critical. Be careful driving. If you feel tired or sleepy, don’t hesitate to call a friend, family member, or coworker, or catch a ride home with a ride share, bus, or taxi. It is clear that sleep is critically important for the health of our 100 billion neurons and their trillions of synapses. 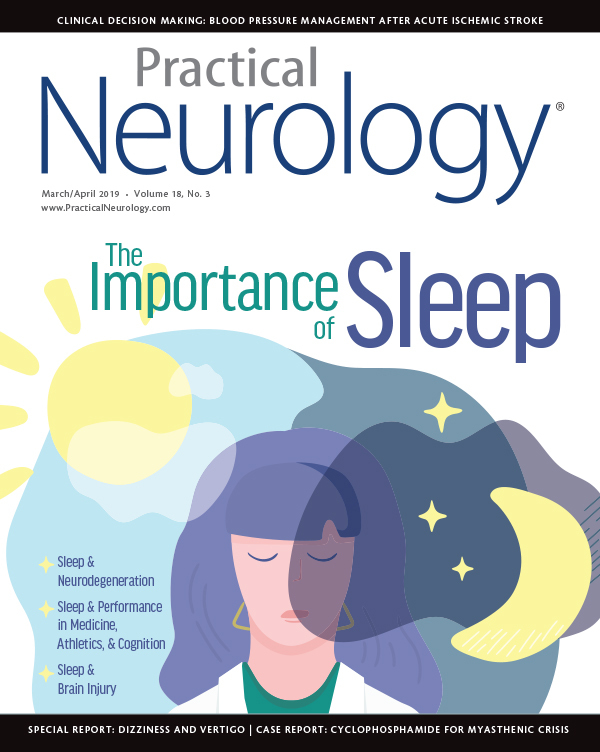 New insights shed light on the neurologic functions of sleep and have implications for the development of novel CNS therapies. For physicians in training, the opportunity to practice medicine and care for others is an honor that requires many sacrifices, including sleep. Fortunately, there are strategies that can help you deal with the 24-hour challenges of practicing modern medicine. Work first to optimize your circadian rhythm and manage any underlying sleep disorder so the sleep you do obtain is as refreshing as possible. 1. Siegel JM. Sleep viewed as a state of adaptive inactivity. Nat Rev Neurosci. 2009;10:747-753. 2. Tononi G, Cirelli C. Sleep and the price of plasticity: from synaptic and cellular homeostasis to memory consolidation and integration. Neuron. 2014;81:12-34. 3. Xie L, Kang H, Xu Q, et al. Sleep drives metabolite clearance from the adult brain. Science. 2013;18:373-377. 4. Blumberg MS, Coleman CM, Gerth AI, McMurray B. Spatiotemporal structure of REM sleep twitching reveals development origins of motor synergies. Curr Biol. 2013;23:2100-2109. 5. Abel T, Havekes R, Saletin JM, Walker MP. Sleep, plasticity and memory from molecules to whole-brain networks. Curr Biol. 2013;23:774-788. 6. Boespflug EL, Iliff JJ. The emerging relationship between interstitial fluid-cerebrospinal fluid exchange, amyloid-beta, and sleep. Biol Psychiatry. 2018 83:328-336. 7. Lee YJ, Cho SJ, Cho IH, Kim SJ. Insufficient sleep and suicidality in adolescents. Sleep. 2012;35(4):455-460. 8. Landrigan CP, Barger LK, Ayas NT, Czeisler CA. Interns compliance with accreditation council for graduate medical education work-hour limits. JAMA. 2006;296(9):1063-1070. 9. Trockel M, Babbott S, Behravesh B, et al. Addressing house-staff physician professional-fulfillment and burnout. International Conference on Physician Health. September 18-20, 2016; Boston, MA. 10. Zee PC, Attarian H, Videnovic A. Circadian rhythm abnormalities. Continuum. 2013;19:132-147. 11. Crowley SJ, Acebo C, Carskadon MA. Sleep, circadian rhythms, and delayed phase in adolescence. Sleep Med. 2007;8(6):602-612. 12. Duffy JF, Zitting K-J, Chinoy ED. Aging and circadian rhythms. Sleep Med Clin. 2015; 10(4):423-434. 13. American Academy of Sleep Medicine. International Classification of Sleep Disorders. 3rd ed. Durien, IL: American Academy of Sleep Medicine; 2014. MH is the President and Co-Founder of Sleep Performance Institute.